Dr. Kurt Marler calls Escondido home, having lived here since he was 6 years old. He graduated from Orange Glen High School in Escondido, and went on to Brigham Young University. 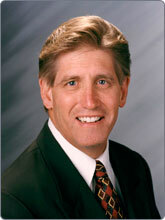 Dr. Marler attended Loma Linda School of Dentistry. In 29 years of practice, he has watched patients grow up and is now treating second and third generations. Dr. Marler and his wife Kathy are parents of 5 children, and grandparents of 20 (it doesn’t get much better than that). Dr. Marler is active in the Escondido schools having served in various positions within the Escondido High School District for 20+ years. He likes to waterski, scuba dive, and serves as a volunteer in his church. Dr. Marler is an avid student of dentistry, attending continuing education classes regularly, to keep current on the latest techniques in dentistry. He is a member of the American (ADA) and California Dental Associations (CDA), as well as the San Diego County Dental Society.